In the last ten years or so, a number of skulls of Indarctos, Agriotherium and Ursavus have been collected from the Late Miocene deposits in the Linxia Basin. Since so far no complete Ursavus skull has ever been found and reported, and a number of questions pertaining to the origin, phylogeny and classification of the Ursinae are quite dependent on a better understanding of ancestral ursid members, especially the genus Ursavus, a well preserved skull of Ursavus was chosen as the subject of the first of a series of papers dealing with these ursid skulls by Professor Qiu Zhanxiang and his colleagues from Institute of Vertebrate Paleontology and Paleoanthropology (IVPP), Chinese Academy of Sciences. The latest issue of Vertebrata PalAsiatica (Volume 52, Issue 3) published their research in the cover article. The Ursavus skull was collected in Huaigou village of Guanghe County, Linxia Hui Autonomous Prefecture, Gansu Province in July, 2006. Ancestral ursine fossils, especially those of Ursavus, are frequently found in Holarctic Miocene deposits, but mainly represented by teeth and fragmentary mandibles. The best specimen so far known is an anterior half of skull from the Island of Euboea (Greece), described in detail by Thenius in 1947. Another better preserved specimen is a skeleton from Shanwang, China, first described as Ursavus orientalis, but later reassigned to the genus Ballusia, of which only brief description of some teeth was reported by Qiu et al. in 1985. 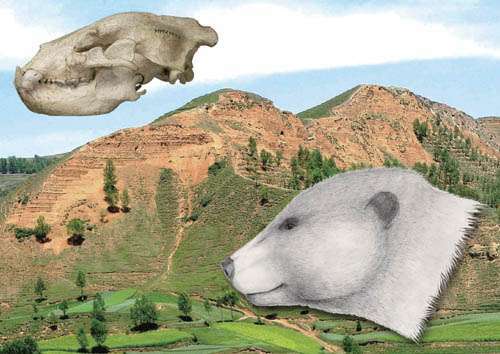 The present skull from Huaigou is thus the first and only complete skull with its associated mandible ever known of these early ursine bears. From the same locality where this skull was found, rich fossils of typical North China Hipparion fauna were found. A preliminary list of the mammalian fossils includes: Promephitis, Metailurus, Machairodus, Ictitherium, Hyaenictitherium, Hipparion, Chilotherium, Sinotherium, Palaeotragus, and Prosinotragus. Of them Promephitis and Sinotherium have already been studied (Wang and Qiu, 2004; Deng et al., 2013). An age determination based on the evolutionary level of the Promephitis species was given as around 9−7 Ma, while on the other hand, 7 Ma was given by Deng et al., based on the presence of Sinotherium lagrelii. It is better to be considered as around 8 Ma for this locality. The genus Ursavus had occupied a central position in study of the early ancestral forms of the living bears prior to the 1940's. Almost every student studying ursid carnivores had considered Ursavus the unique ancestor of living bears since the end of the 19th century. 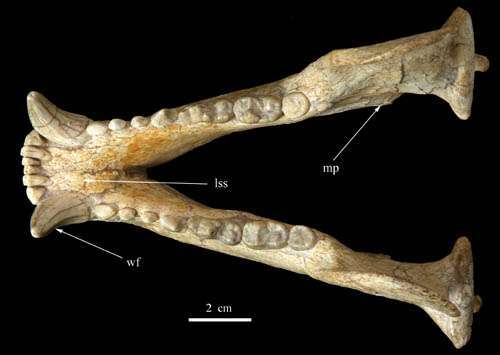 The genus Ursavus was established by Schlosser in 1899, based mainly on the material of U. brevirhinus (two incomplete hemimandibles, one maxillary with upper dentition, and some isolated teeth) from three localities (Steieregg and Voitsberg, Austria; and Kieferstadtel in Oppeln, now Poland). From the context of Schlosser's description the following can be viewed as more diagnostic for his new genus, in comparison with the living bears: size is small, about wolf-sized. Canines are more laterally compressed, with clear anterior and posterior keels. Premolars are always four in number, separated by short diastemata. Except P4, all premolars are simple, without secondary cusplets. The second and third premolars are double-rooted. P4 metastyle is blade-shaped, its protocone considerably far posteriorly shifted, with strong inner cingulum. The crown surfaces of molars are strongly wrinkled. Upper molars are rectangular, slightly longer than wide, each with two outer and two inner cusps, massive inner basal bulge and well developed external cingulum. M2 has short talon. The m1 trigonid is much higher than its talonid, which is large, with strong, but low hypoconid and small entoconid. The m2 protoconid is low, but metaconid considerably strong, without paraconid. The m3 is knob-formed. Later, with increasing finds of new materials from Early and Middle Miocene deposits, majority of which were, unfortunately, isolated teeth, Ursavus had gradually become a large heterogeneous genus. Up to now, 11 forms of this genus have been established. Opinions differed widely among paleontologists as to the reliability of referral of some of these species to the genus Ursavus. At least two species, U. depereti and U. elmensis, were formally excluded from the genus Ursavus. While establishing a new genus, Agriarctos, based on some isolated lower cheek teeth from the latest Miocene deposits in Hungary, Kretzoi (1942) transferred the type specimen of Ursavus depereti to his new genus Agriarctos, and tended to associate it with his smaller species, Agriarctos vighi. 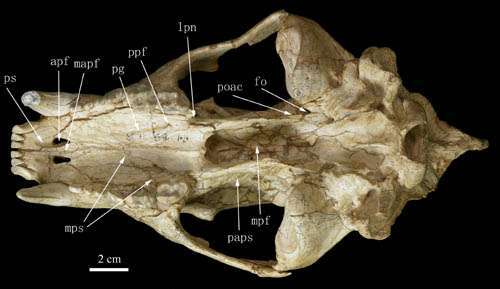 Based mainly on the diagnostic characters of the m1, i.e., the tooth being short and wide, with strong, anteriorly shifted metaconid, thus forming a rather closed trigonid, Agriarctos was considered by Kretzoi an intermediate form between Ursavus and the Agriotherium-Indarctos lineage. 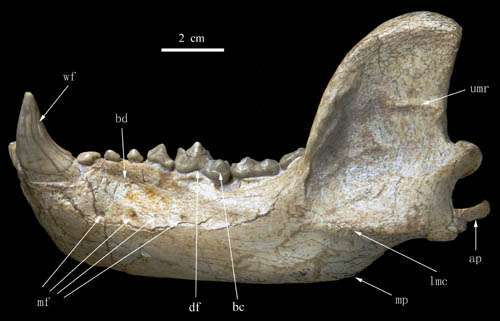 Qiu and Qi in 1989 established a new genus and species, Ailurarctos lufengensis, belonging to the giant panda lineage, based on a few isolated teeth from the famous Lufengpithecus site in Yunnan, China, which were originally referred to Ursavus. Ginsburg and Morales (1998) also established a new genus, Ballusia, based on Ursavus elmensis. Diagnostic features of this new genus can be summarized as: size generally smaller than Ursavus; the lingual crest (formed by protocone and metaconule) of upper molars widely separated from the buccal cusps (paracone and metacone); lingual cingulum wider and more curved; M2 clearly elliptical, with short but wider talon; the m1 resembling those of Hemicyon and Plithocyon in having higher trigonid. They suggested that U. orientalis might be close to the root of this lineage so that Qiu and Qiu (2013) temporarily transferred it to the genus Ballusia. Just recently, Abella et al. (2012) created a new genus, Kretzoiarctos, based on a combination of a partially preserved right hemimandible with a left P4 and an M1 from Spain, first identified as a new species of Agriarctos. Based on cladistic analysis, Abella and colleagues concluded that Kretzoiarctos beatrix was the oldest recorded member of the giant panda lineage. Their Ailuropodinae include two subclades: the Indarctos one and the ailuropod one, with Ailuropoda being the first split from the remaining members of the latter subclade. Qiu and colleagues' cladogram shows that Kretzoiarctos is a sister taxon to the other two genera (Agriarctos and Ailuractos). Since Ailuractos is certainly the earliest know ancestral taxon leading to Ailuropoda as clearly evidenced by the tooth morphology, Kretzoiarctos may not be directly ancestral to Ailuropoda. In fact, K. beatrix does not possess the key characters leading to Ailuropoda: the enlargement of the premolars, especially the anterior and posterior accessory cusps and the short and V-shaped m1 trigonid. On the other hand, these characters, together with the presence of small parastyle and doubled protocone of P4, can be found in Indarctos species. Thus, it is highly possible that Kretzoiarctos is the ancestral taxon of Indarctos clade, rather than that of Ailuropoda. Ginsburg and Morales (1998) came to the conclusion that the earliest member of the Ursinae is Ballusia, which gave rise to the Ursavus-Ursus lineage, while Agriarctos gave rise successively to Agriotherium and Indarctos, and finally Ailurarctos and Ailuropoda formed the pair of sister taxa. As thus defined, the primitive members of the Ursidae include: Ballusia (3 species), Ursavus (8 species), Agriarctos (3 species), Ailurarctos lufengensis and Kretzoiarctos beatrix, altogether 5 genera and 16 species. So far no complete skull in association with its mandible has ever been described for any of the genera Ballusia, Ursavus, Kretzoiarctos, Agriarctos and Ailurarctos. The best material so far known is an anterior half of skull published in 1947 and two fragmentary hemimandibles described in 1887. This blank is now filled by the Huaigou specimen. 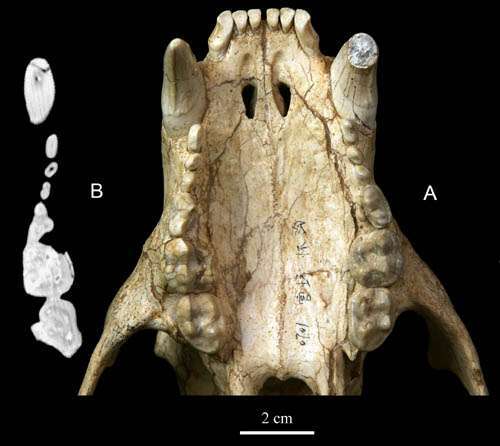 Being one of the latest occurred (~8 Ma) and highly advanced member of the early ancestral ursids, the Huaigou skull may be quite different from the majority of the species in Early-Middle Miocene and early Late Miocene in possessing more advanced characters leading to the living bears. It seems safe to say that the Huaigou specimen cannot be ascribed to any of known ancestral forms of the living bears, so this specimen warrants a separate species status, here named as Ursavus tedfordi. The species name is to cherish the memory of Richard Hall Tedford, the great North American Neogene biostratigrapher and paleomammalogist, who recently passed away on July 16, 2011. U. tedfordi is a large-sized Ursavus species, roughly intermediate between Cephalogale minor and Selenarctos thibetanus in size, proportion and morphology. Its diagnostic characters include: the muzzle is short and broad compared with the back part of the skull; the sagittal crest is enormously high posteriorly, overhanging far beyond the nuchal surface; the cranial part is narrow compared with the facial part; the tympanic bulla is triangular in form, with a short tubular external auditory meatus; the mandible is robust; premolars are strongly reduced in size and button-shaped; enamel wrinkles are hardly developed on cheek teeth. Taken as a whole, there is no doubt that Ursavus tedfordi is the latest and the most advanced among known ancestral forms of the living ursine bears. However, in view of the precocious appearance of some features not seen in the living ursine bears, U. tedfordi might well be an aberrant form, being one of the latest sister taxa of the clade consisting of the living ursine bears.